Public broadcasting includes media outlets that operate as a public service. Unlike commercial broadcasting, public media is non-profit and operates from donations from private citizens and businesses. As a public media station, Michigan Radio prides itself on supporting a strong civil society. Which are fancy words for…what? To put it simply, we are committed to improving society by providing information that educates, enriches and strengthens. Unlike commercial news stations, we go beyond the headlines to discuss not only the how and why of events but the ways that we can prevent the negative ones and increase the positive. Our Mission Statement: Michigan Radio’s mission is to produce and distribute trusted content to inform, educate, and entertain people who care about the State of Michigan and the world around them. Every level of our organization is focused on this mission from reporters to management to membership. Every decision we make is to move our mission forward. As a corporate sponsor, your support of our mission lends your organization credibility and lets our listeners know that being a part of a strong civil society is important to you. 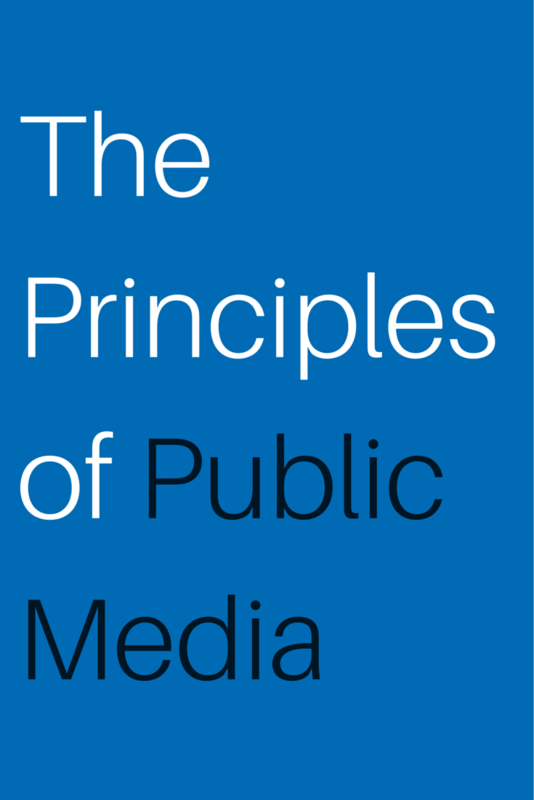 Click on “The Principles of Public Media” under categories to see more in this series. In our Invisible ROI series, we’ve discussed the type of return on investment that you receive when you build real relationships with your customers, including the importance of engagement with your brand. Social Media has become an important part of engaging with customers online. It gives you another touch point with customers and allows them to interact with your brand directly, giving you immediate relationship building results. It can be hard to know how to balance what you’re sharing on Social Media so your base is engaged without over-sharing and scaring them away. Be of service: What is your area of expertise? If you’re great at building bee hives and know a lot about bee keeping, that’s what you should be talking about. Share information that is helpful to your customers and they will remember you for it! Be friendly: Every post shouldn’t be a call-to-action. People don’t respond to someone constantly pounding on their door and begging them to buy their product. Social Media is no exception. If you do use a call-to-action, make sure you highlight that you want to be helpful to your customer. Be responsive: Many customers will engage with your brand directly on Social Media by posting on your page, tweeting at you or mentioning you in a comment – be responsive to them! This holds true whether they are complimenting or complaining – address both in a timely and professional manner. Remember that this is a public forum; how you present yourself is how the world will see you! There are a lot of great tools and tips to help make your Social Media experience easier – check out our toolbox for some of our favorites. Contact us for more information about how a Michigan Radio corporate sponsorship will help you build relationships with our listeners. Click on “The Invisible ROI” under categories to see other articles on this topic. In recent years, Public Radio has become has become more recognizable for the valuable service that it provides. Check out Ira Glass’ article about why your underwriting dollars are so important to Public Radio and how they are used to help us grow! Thank You to Our Mid-Michigan Sponsors! On May 1st we hosted our first Sponsor Appreciation event in Lansing for our mid-Michigan clients. We enjoyed an afternoon dedicated to recognizing the contributions of valued Michigan Radio sponsors at The University Club of MSU, who provided a perfect venue for our event. We appreciated getting to know our clients better and sharing with them more information about the programs that their sponsorship dollars support and we look forward to hosting future events for Corporate Sponsors covering all of the Michigan Radio listening area. Keep an eye on your email inbox for an invitation to the next event! Thank you to the sponsors that were able to join us! The new president and CEO of NPR worked for nearly two decades in broadcast radio. But he says it’s his recent experience as a business executive and investor that will strengthen the 45-year-old media organization. To continue our conversation on the invisible ROI, we’ll start by digging a little deeper into ROE2 – return on experience x engagement. What, exactly, is experience? Every point of connection that your customer makes with your brand is part of their experience. This includes things like making a purchase, using your website, seeing an advertisement, interacting with your product or service, or receiving additional product support. Engagement has more to do with the way the customer is relating to your brand: sharing their experience on social media, recommending your product and writing a review are all examples of engagement. The goal is to receive more engagement with positive experiences than with negative, and you can control that by creating more positive experiences for your customers. It’s not only important that people buy what you’re selling – it’s also important that they buy it again and that they tell their friends about it. When they “share” you on social media, become “friends”, tweet about you, connect with your brand, which is exactly the point. Relationship building should start at the very beginning: the first time your potential customer hears about you. Michigan Radio can help with that. We reach more than half a million listeners weekly; listeners that care about public radio and care about supporting businesses that support public radio. Click here to learn more about how the halo effect works. The more you engage Michigan Radio listeners, the more positive their relationship is with your brand, the more likely it is that they will use your product or service when they need it and the more likely it is that they will tell their friends. When our listeners hear your spot on the air, it’s as though they are being introduced to you by a trusted friend. What better relationship starter is there than that? Michigan Radio believes in the power of education and so do our listeners. Because our audience is unusually well educated, a Michigan Radio sponsorship will allow your school’s message to reach an audience that is interested in investing in their future of their children. As a financially affluent group, our listeners are uniquely capable of empowering their children by providing them with a strong education. Contact us to find out more about how a Michigan Radio Corporate Sponsorship can help you get the word out about what your college or university has to offer! When juggling multiple platforms, markets, and budgets, it can be difficult to know exactly when is the best time to become visible, to commit to a campaign and get the word out about your organization. Good news! When it comes to scheduling a campaign, we offer a ton of flexibility. If you’re in the midst of planning, the sooner you contact your Michigan Radio account executive, the better! Let us help you plan your schedule in ways that will help you reach your goals! But, really, when should you schedule with Michigan Radio? There’s no easy answer to that question, but it’s a great place to start! Do you have seasons when you’re busier than other times? It seems inevitable that during certain times of the year your phone will be ringing off the hook and your calendar jam-packed. Focusing your marketing efforts during your busiest time would be a great for capitalizing on activity to help meet your annual goals! This can be a great time around which to focus your marketing efforts – your message reaches the ears of additional customers when they may need your products and services the most! The opposite is true too. Is your business or organization hectic enough during your busy time, that any additional marketing efforts would be unnecessary? It’s also possible to use your slower season to plant the seed with our listeners so that they’ll be well aware of your organization when they need products and services that you offer. Even better than selecting your busy or slower season is to air your message as much as possible, across all seasons. This allows you to reach people at all points in their buying/decision making cycle. You can’t go wrong with Michigan Radio! Contact us to discuss your goals and let us help to set up a schedule timed for when YOUR organization needs it most! Everyone wants to see a measurable return on their investment, whether investing time, energy or capital. But, let’s be frank: some things are immeasurable. You would never consider, for example, applying ROI to your relationship with your spouse, children or closest friends, would you? It’s also more difficult than you might think to determine the returns on your marketing investments. Many platforms would have you believe that the higher number of impressions, views or clicks equal a more effective marketing campaign. Andy Frawley, CEO of Epsilon, came up with a formula that is a better fit for measuring marketing effectiveness than ROI: ROE2 = return on experience x engagement. Frawley contends that ROI overlooks some important elements in marketing campaigns, primarily emotion. How consumers feel about a brand greatly impacts how well a marketing campaign works, and also controls brand loyalty. Apple fans will stand up for the brand in online forums, will stand in line for the latest product, will stand through failures and mistakes – Apple fans have, essentially, become a branding tool for Apple. How do you get that same loyalty? You build relationships. That’s what we’ll be talking about in the Invisible ROI series – stay tuned! Michigan Radio’s digital assets are becoming increasingly more important to our sponsors’ marketing strategies. Measurable – Your webtile on michiganradio.org is trackable! You can measure engagement though your website’s analytics by designating a specific landing page or by tracking traffic from michiganradio.org. Visual – Your digital sponsorship allows you to connect a graphic representation of your organization to your radio message. In addition to telling our audience what you’re about, you’ll also be able to show them your brand. Unobtrusive – As with everything we do, our promotional messages are unobtrusive and have the feel our audience has come to love and appreciate. Our simple web tiles signal to our online audience that you support a service they trust and depend on. Small Investment for a Large Audience – Our web tiles are prominently featured on michiganradio.org. With an average of more than 900,000 pageviews per month in 2018*, michiganradio.org extends your radio schedule to our online audience. Our webtiles are priced by the month, versus by impression or click, allowing your rotating webtile to get as many views as possible. Webtiles are also discounted when paired with a radio schedule. Have you thought about including Digital Sponsorship as part of your marketing campaign with Michigan Radio? What’s holding you back? Contact us to discuss! *Source: Google Analytics of michiganradio.org, January – December 2018 pageviews/average per month.